The Independent National Electoral Commission has revealed that, the senator representing Ogun East and governorship candidate of the Peoples Democratic Party in the state, Prince Buruji Kashamu has no academic certificate as the commission published a blank result space against his name. This revelation was made through the final lists of governorship candidates and their running mates who will be contesting the governorship seats in the states across the country come March 2nd. PLATFORM TIMES recalled that senator Kashamu yesterday told the council of Obas in Ilaro that he holds a diploma in English language from the University of Lagos. 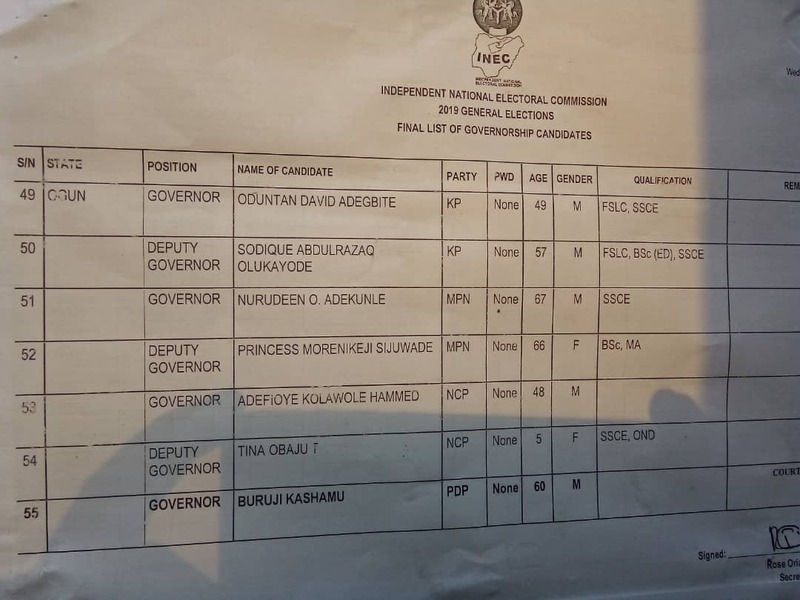 However, our reporter observed that although INEC published his name as the governorship candidate of the PDP in Ogun state but his qualification was conspicuously missing on the posted list. Meanwhile his running mate Reuben Abati, according to INEC holds BA, MA,LLB and PhD. Our reporter also noticed that Kashamu is not the only candidate who has no certificate on the list as the running mates of AGA, Sanusi Omolola and Omobolanle Akinruntan of PT party and as well as the governorship candidate of NCP, Adefioye Hammad were also spotted without a qualification on the list.